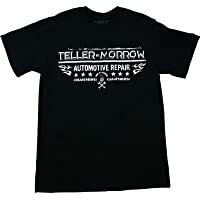 This Teller Morrow t-shirt certainly advertises a legitimate business, not a front for a motorcycle gang... Black tee features a distressed, screen printed design of the Teller Morrow logo, with a tiny Sons of Anarchy symbol at the bottom. Standard men's sizes. 100% cotton.